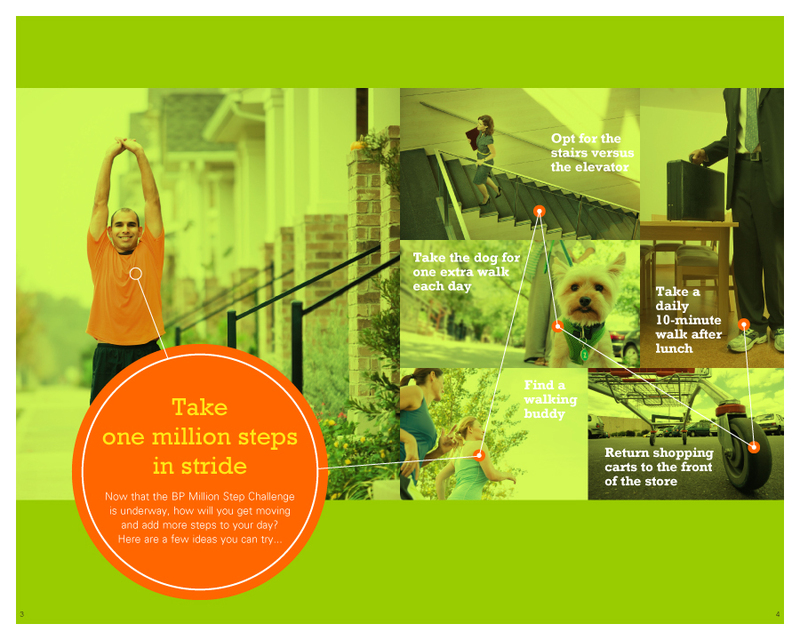 In BP’s second year, the Million Step Challenge encourages employees to reach a one-, two- and three-million step goal. As of July 2013, more than 20,000 BP employees, retirees, and their families signed up and are working towards their million steps. With employees leading increasingly busy lives BP needed a way to motivate employees to get on their feet. With this editorial in the BP ‘Benefiting You’ publication, PRISM visualized a few ideas for employees to take inspiration from. By showing employees ideas, it’s easier to get their feet walking towards better wellness. BP encourages Million Step Challenge participants to “go for an awesome life”. Employees receive a free Fitbit to count their steps. For every millions steps taken, employees are awarded points. In addition, BP was recently named the #1 Healthiest Employer in the Houston Area (companies with 5,000+ employees), by the HBJ. This entry was posted on April 8, 2014 at 6:39 pm and is filed under Branding, Employee Communications, graphic design. You can follow any responses to this entry through the RSS 2.0 feed. You can leave a response, or trackback from your own site.